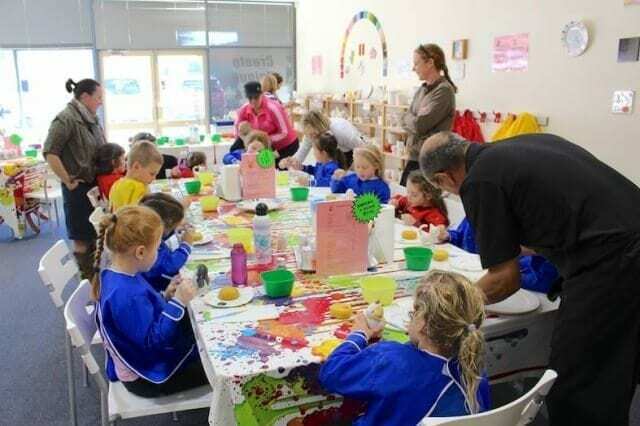 For my 6 year old’s recent birthday party, we chose a ceramic painting party at The Pottery Playroom in Joondalup, which has an indoor play area and a small café. The friendly owner Adrian answered all my questions over the phone and I booked the party about 6 weeks in advance, paying a $50 deposit that was deducted from the total cost on the day. Our party time slot was 10am–12. Some kids were dropped off and only a few parents stayed which worked well. 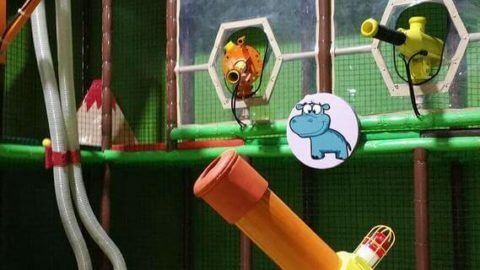 While we waited for everyone to arrive, the kids could play on the indoor play structure. (The age limit is 8 years old, and kids must wear socks to play.) 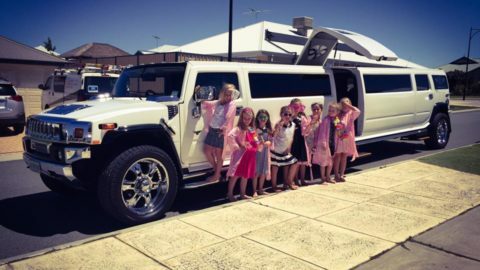 Our 12 party guests were all aged 6 and under, so they had a lot of fun. 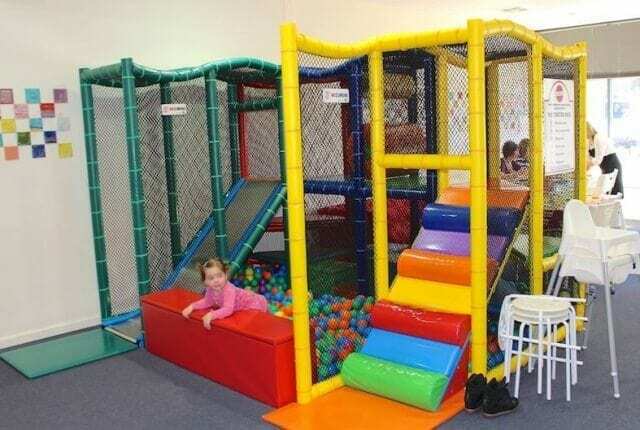 It’s not massive but has a ball pit, soft steps, a slide and various soft-fall parts to climb through and under. 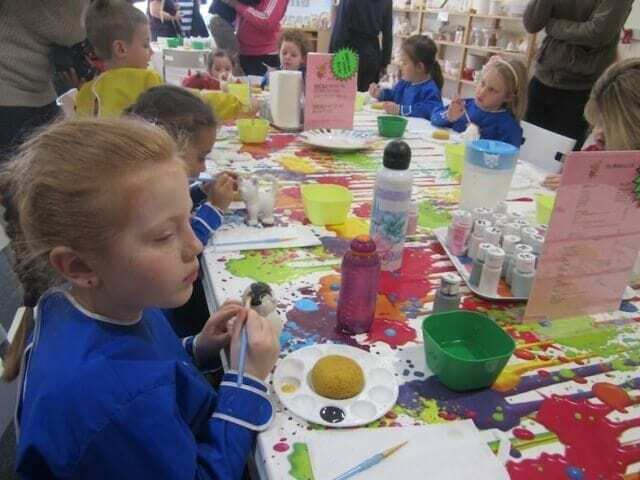 Once everyone was there, we were led to our own big table that had already been set with a paint palette, sponge and brushes for each child. Adrian led the party from then on, guiding the kids and paying special attention to the birthday girl. 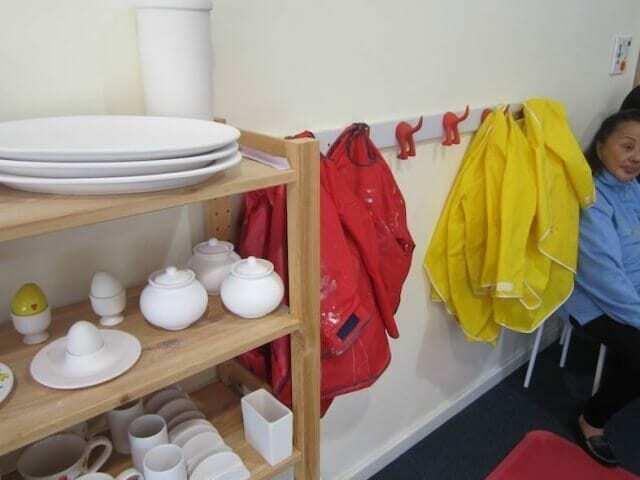 Each child got given an apron to use while painting, and one by one they were asked to go and choose an unglazed piece from a small but varied selection that had been put out for us. So there wasn’t a mass scramble or chaos – everything was calm and organised and flowed perfectly. 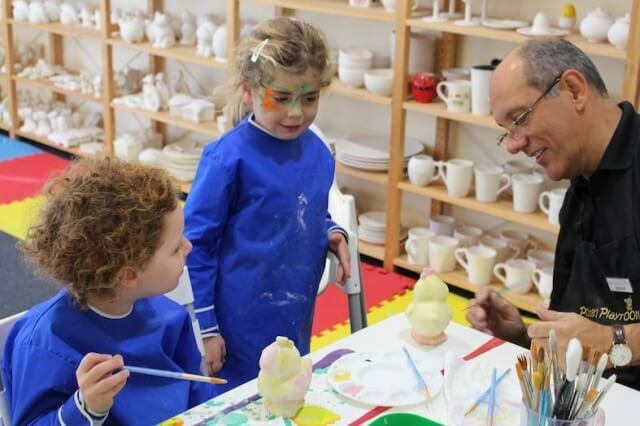 The dedicated owners were very involved and there was a young assistant too who supervised and made sure each child had the paint colours they desired and knew what to do. I got the impression that the owners really take pride in their business. The kids absolutely loved the painting time, which lasted about 30-40minutes. They were not rushed and could finish in their own time. 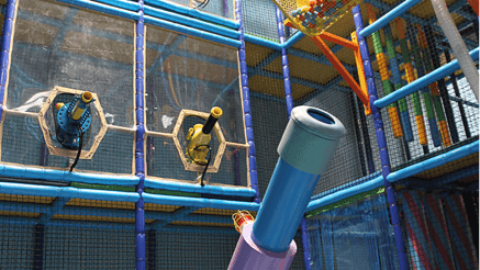 Some of the kids who finished early could leave the table to play again in the play area. Meantime the parents mingled and chatted over a hot coffee (I kept a tab for guest coffees), which the Beehive Café made to order. 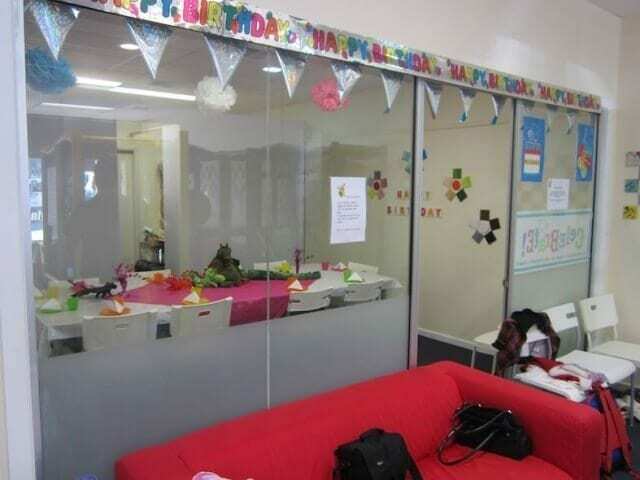 There is a sofa alongside the play area, but the main room is so spacious that there was plenty of space for the adults to move around without disturbing the kids. 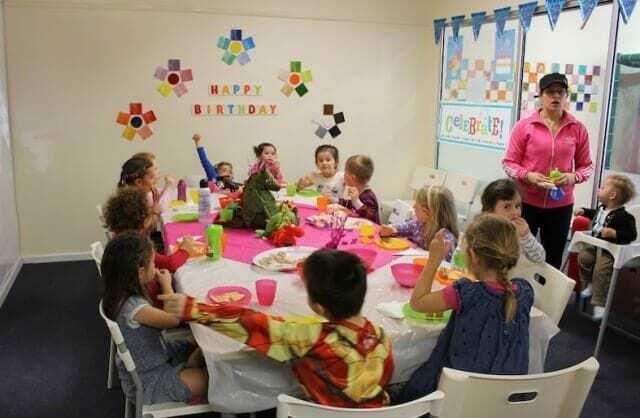 When everyone was done painting and while they were enjoying some more play time, the food was brought to the party room table. 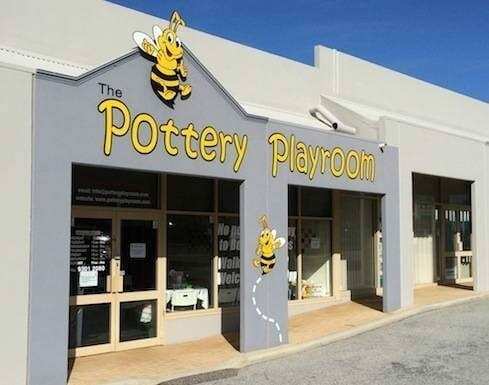 This room is separate from the rest of the pottery café. I chose to have a catered party, so the party food was included and what a pleasant change it was from the usual greasy offerings! 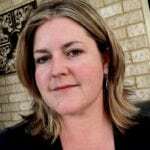 There were platters of fresh sliced watermelon, ham and cheese sandwiches, fairy bread and several small bowls of chips and marshmallows for a touch of sweetness. The kids demolished it all. Jugs of juice and water were also served. The spotless party table is set in a simple but effective way: a white table cloth and colourful Ikea plates and cups. 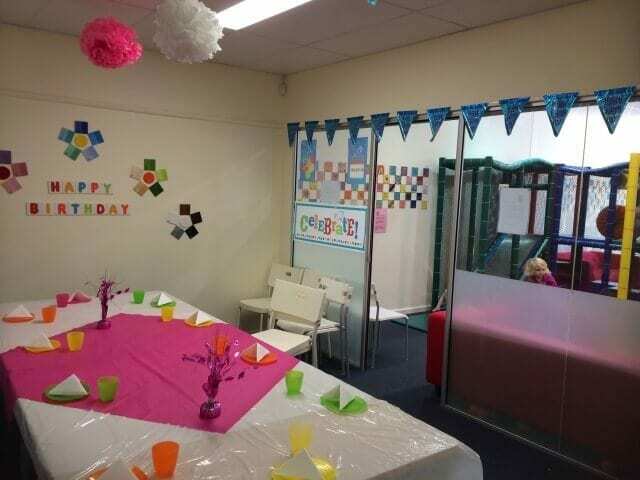 On the wall is a cheerful Happy Birthday sign and some birthday bunting. You are allowed to bring in themed tableware if you want a specific theme, as they do not offer themed parties. 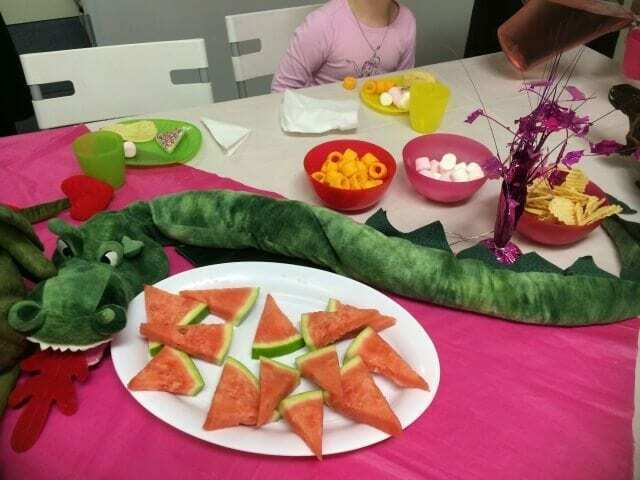 My girl wanted a dragon party, but to keep it simple, I made use of the colourful plates and simply added a centrepiece of soft toy dragons, and my Dragon Cake completed the theme. 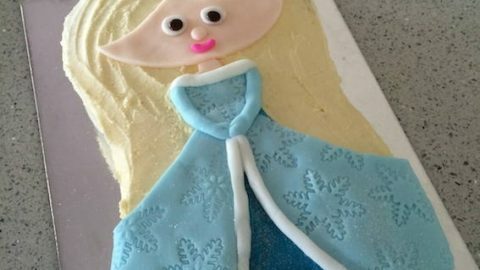 All I had to provide was the cake, and the party bags to take home. After eating, the kids had another play time, while the table was cleared for the birthday cake. Everyone came back to sing Happy Birthday and eat cake, and then the party wrapped up by Midday. The kids continued to play happily while parents arrived to fetch them. 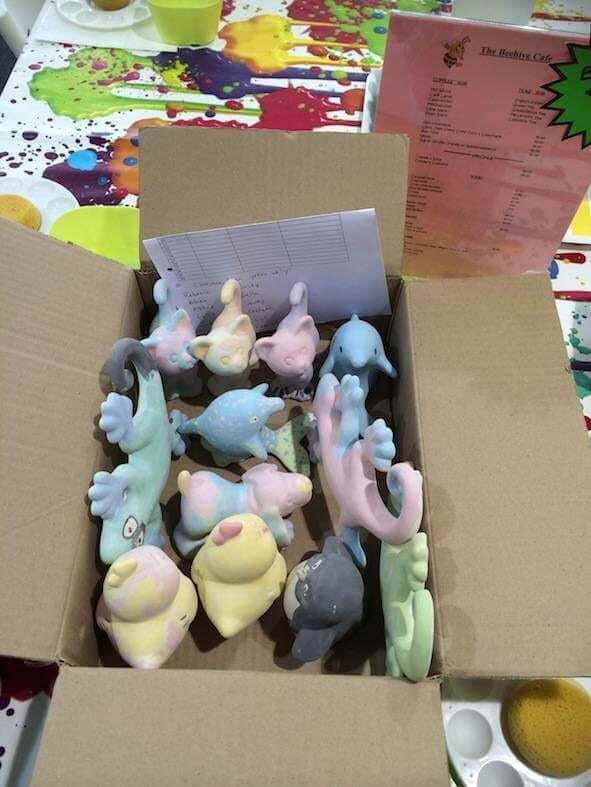 The kids’ masterpieces take about a week to 10 days to be fired and the Birthday Mum is then contacted to collect them all at the same time to distribute to her party guests. Each guest’s item is wrapped individually – another lovely touch. The Birthday Girl also gets an extra special gift: Adrian made sure that each guest made a paint fingerprint on a special plate. 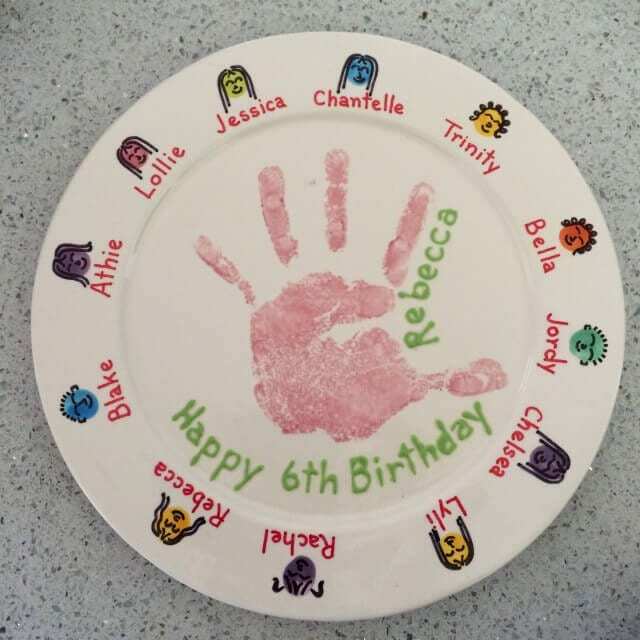 Their names were written on it too, and the birthday girl made her handprint in the centre of the plate. 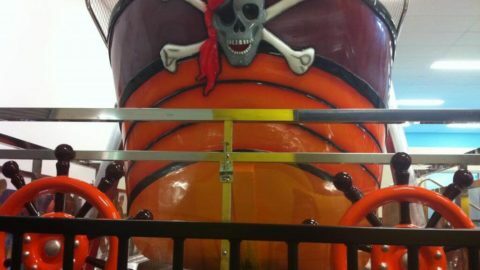 I was so touched to receive the finished product – a great souvenir of a smooth sailing and fabulous party! The cost for our party including food and the ceramics was $25 a head (minimum 8 kids). There are other party package options available. 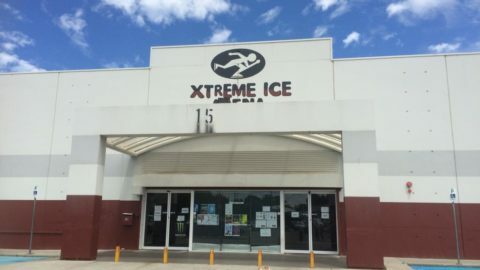 The owners are quite willing to discuss your individual requirements. You can also download one of their party invitations to use. 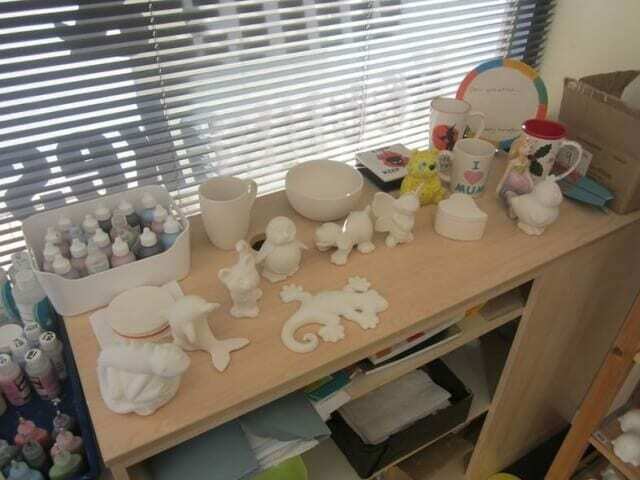 Visit The Pottery Playroom website for more information. 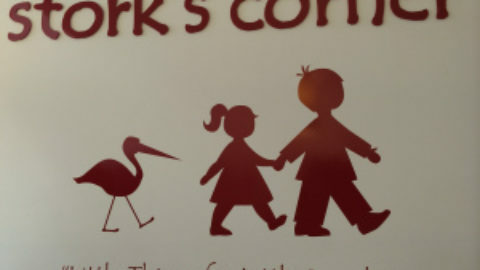 TIP: I was worried about siblings that sometimes gatecrash with your invited guests, but I was reassured that they would be accommodated at the other café tables if they wanted to paint too and charged normal customer rates – a great option if guest parents are stuck and have to bring another child along. 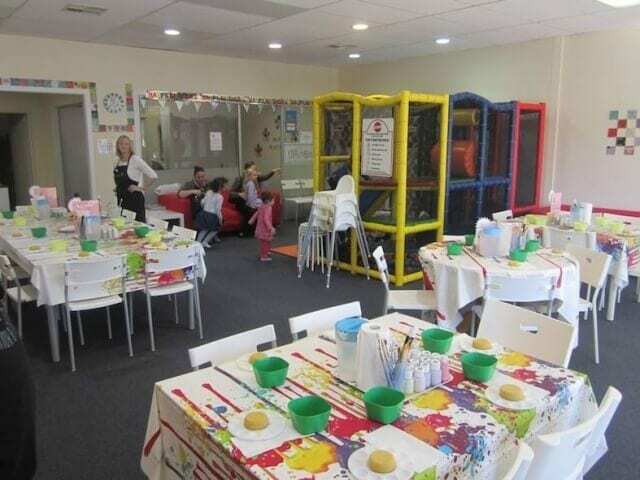 They can order food from the café as well, as the rest of the Playroom is still open for business while the party is on.